Hey, quick question! Do you think Taiwan’s government-run social media efforts should be this amateur, unprofessional and embarrassing? 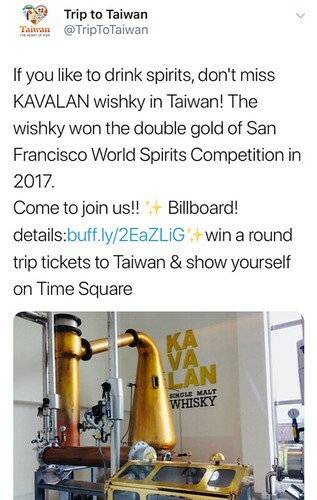 Is it too much to ask that the person representing Taiwan on social media run a simple spellcheck before posting about Kavalan? The word “whisky” is right there in the image. Or perhaps the person could ask themselves, does this topic make Taiwan shine? Or does it make Hong Kong shine? Or Japan shine? Also note the lack of photo credits in all of these posts except in the case of the Arashiyama one. 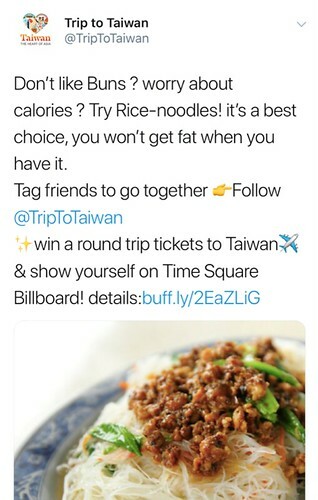 And with all the possible topics the Taiwan Tourism Bureau could be sharing to promote Taiwan on social media, do you think these are suitable? Or are they completely tasteless and ridiculous? Gosh, what about just putting any effort at all into writing a caption because that’s your job? Or fact-checking before posting? Jiufen was not the inspiration behind Spirited Away. Here’s a clip of Miyazaki saying so on Taiwan’s TVBS news. 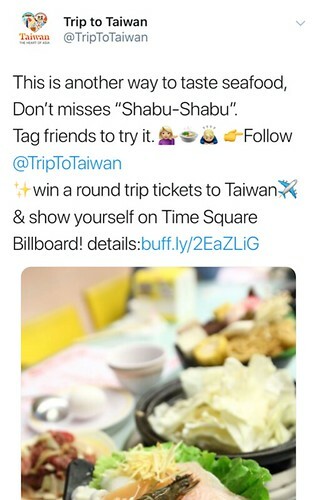 The shortlink on all these posts goes to the same website — taiwantourism.guide — which promotes a long-running competition for a free round-trip ticket from NYC to Taipei. Aren’t they basically confirming they were told to cut and paste from their travel website?! 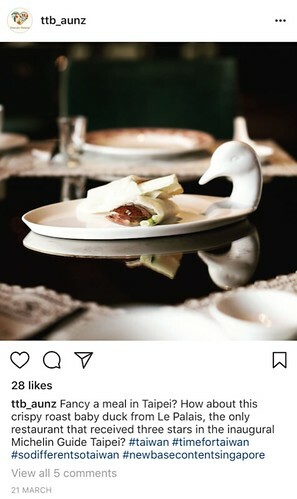 Poking around online, I found 7 other official government-run Instagram accounts representing the various overseas offices of the Taiwan Tourism Bureau. The Bureau runs 13 overseas branch offices in total. You can see the official organizational chart here. Some of the accounts are pretty much neglected. For instance, the LA office account has only posted 5 times since April 2016, and the Singapore account 38 times since March 2016. I guess it’s not that big of a deal when the LA office account only has 178 followers and the Singapore account has just 672. The only account with a significant follower count is the notorious @triptotaiwan with 13.4K. (Oh, great.) Next is the India account with 5,968. To compare, @indtravel is the official account of Indonesia’s Ministry of Tourism and it has 484K followers. Visit Japan has various regional accounts but its main international account @visitjapanjp has 106K followers. Finally, the @imagineyourkorea account by the Korea Tourism Organization has 60.8K followers. 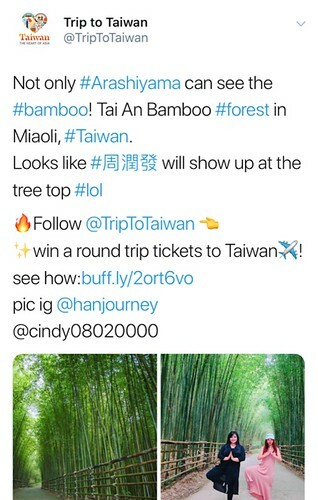 Here’s something funny: Taiwan Tourism Bureau’s Australia and New Zealand Instagram account has a measly 360 followers but it’s run by a media agency in Singapore called NewBase Content. I guess this work was part of a bigger campaign for the Australia and NZ office under the slogan, “So different! So Taiwan!” This is the 2017 case study from the NewBase archives. But someone at the Taiwan Tourism Bureau must be satisfied with their work. It looks like NewBase Content is getting paid for two more “major campaigns” in 2018. Press release here. Finally let’s get back to @triptotaiwan and the taiwantourism.guide website. It looks like Taiwan Tourism Bureau hired an agency in New York called The Tiger Party. The agency is owned by a Taiwanese guy named Rafale Chang. The Tiger Party produced this Times Square billboard campaign that was essentially a giant FaceTime between Times Square and Taipei despite there being a 12-hour time difference between the two cities which meant the live feed on the Taipei side happened at midnight. The Tiger Party was also paid to create the taiwantourism.guide website. 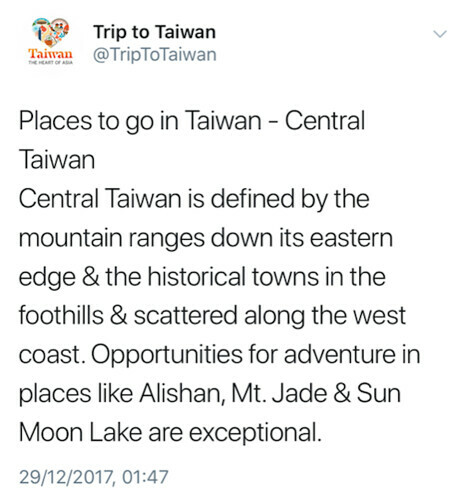 It’s yet another unimpressive and unoriginal government-paid travel website to throw onto the heaping pile of Taiwan government-paid travel websites. 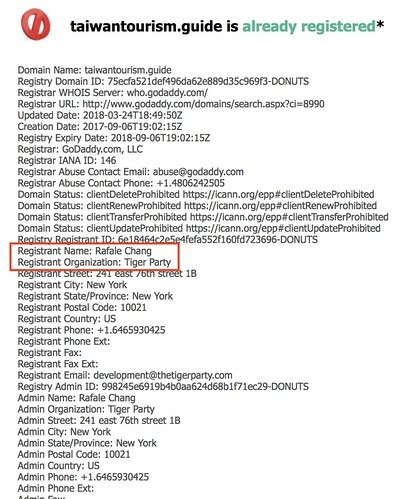 By the way, we know The Tiger Party built the site because the whois search on the domain is registered to them. They didn’t transfer ownership to Taiwan Tourism Bureau. The funny thing is I know of one instance where The Tiger Party turned down professional help. I also know of an instance where they approached a blogger specifically about their Taiwan Tourism project…then never responded to her reply. 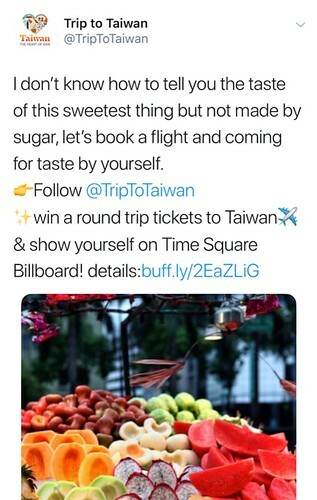 This complete disinterest in content strategy by everyone involved with Taiwan Tourism (employees and vendors included) is probably why poor Taiwan has so many slogans, websites, social media accounts and useless but flashy advertising campaigns. When was the last time (or first time!) you audited your marketing strategy? What’s the vetting process for your vendors? Who writes the Requests For Proposals (RFPs)? Are there content guidelines in place for marketing and social media posts for the overseas offices? Who decides the people managing and creating content for the official social media accounts? 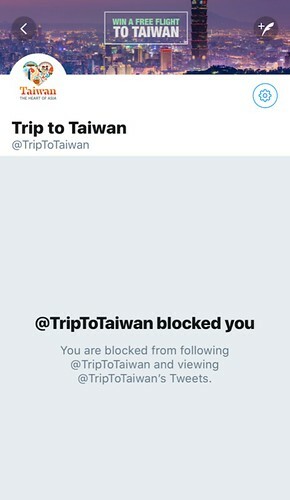 Seriously, who’s behind the @triptotaiwan account? Is it okay for this account to block followers? 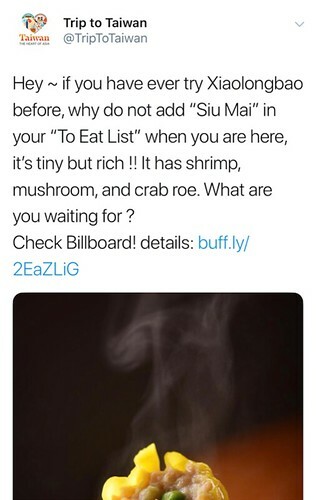 Finally, how much will you be spending this year to make Taiwan look so bad? Here’s Part 2 about the work overseen by the Taiwan Tourism overseas branch in Frankfurt. 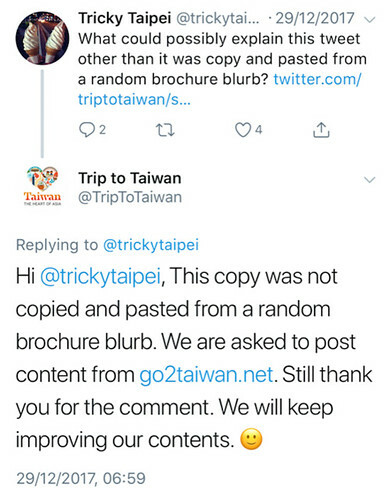 Update: Since this article was originally posted on April 18, the @triptotaiwan editor has changed and the posts included below have been deleted on Twitter and Instagram. Marketing strategy? 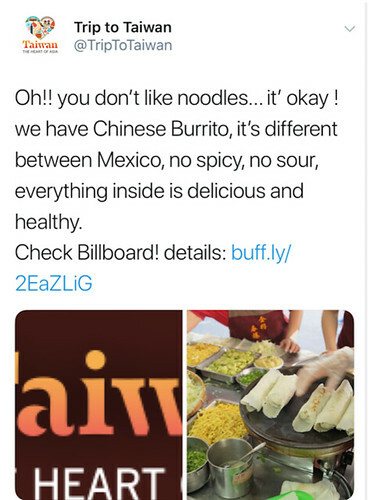 Are there any marketing strategists in all of Taiwan? Sometimes it feels like the important thing in Taiwan is to appear busy, rather than focus on outcomes. the MoC account is very respectable. The woman in charge of it has been doing a fantastic job for years. Agreed, thats a cow on a pig farm, but, credit where credit is due. Absolutely agree with Sell Out’s comment on the MoC account. They are doing a great job, so excellent to see them being given their due. As for the rest of this post, excellent reportage and investigative journalism overall! Excellent reporting and insight! After 30 years in Hawaii, I’ve seen a lot of similar criticisms of the Hawaii Visitors Board — lack of funding oversight, questionable messages, unclear results. But at least their English is solid and their production is professional — not true here. The problem is corruption and utter lack of insight into convincing and fresh messages that might induce people to visit: only stereotypes and cliches ring true to those with no ear for English. 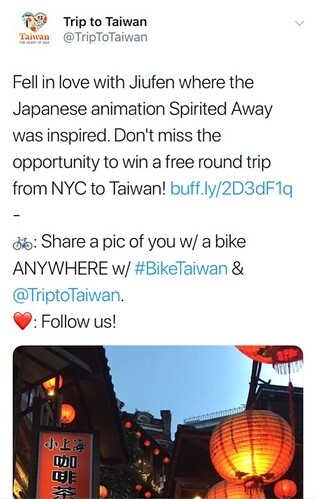 A foreign friend who bid to help Taiwan tourism tried to discourage them from the meaningless-beyond-Taiwan “Naruwan” campaign and was slapped down. Results are secondary or even obscured — if it pleases the boss, the job is done. 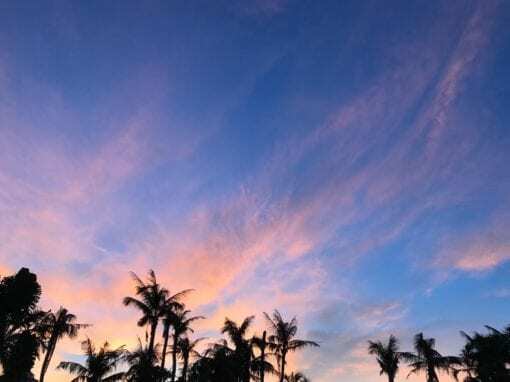 “We hope the slogan will become like `Aloha’ in Hawaii, becoming a word that Taiwanese people welcome foreigners with,” he said, adding that although Taiwanese people don’t often say Naruwan, the word would now be used frequently at tourist spots and performance venues. Superb! Nothing more needs to be said. 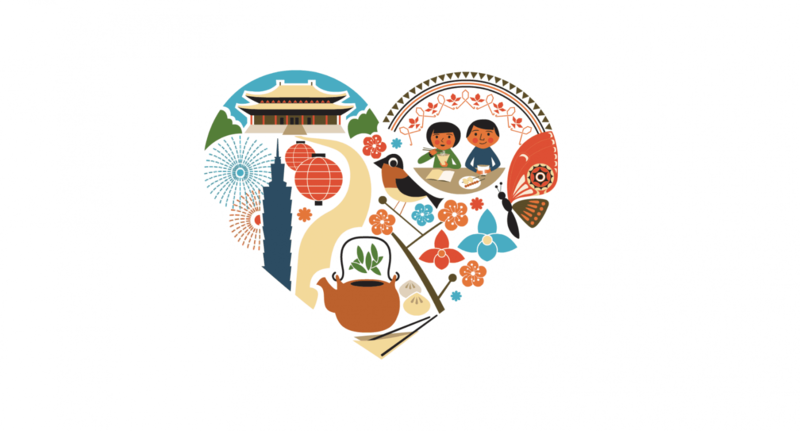 Also worth noting: the treatment used in the heart shape cartoon design at the top of the post was done by Tyler Brulé’s Winkreative group out of Switzerland (https://www.underconsideration.com/brandnew/archives/taiwan_a_heartfelt_destination.php). When this rolled out it was in stark contrast to the tone-deaf “Let’s Be Friends” campaign (and I think another one as well) that Ran concurrently. Completely disjointed and uncoordinated, which does Taiwan no favours. Ha. The Tourism Bureau is a joke. When I made my cartoon map of Taipei City years ago and was looking for a distribution, the fuzzy brained old official there was pretending to look at it and to be interested as we sat looking down at greater Taipei. He got a phone call. While he was answering the call, I turned the map over to the special districts map, which also included a cartoon description of how to use the green and red mailboxes. (No email back then.) When he returned, he looked down through his glazed over eyes at the map and continued rambling nonsense (“You English teachers make lots of money in Taiwan, etc). He hadn’t even noticed he was looking at a very different side of the map. He ended by saying “we already have a map “, though it was a rather lame and useless and uninspiring Taipei map with very little information. I gave my map to Caves Books to sell instead. They did very well with it, and won a lot of praise for it. The Tourism Bureau is a waste of money and should be shut down. Useless, uninsighful. A waste of tax payers’ money. So true! They also don’t support local bloggers and sponsored a bunch of international influencers that had fake influence. Get it together tourism board. 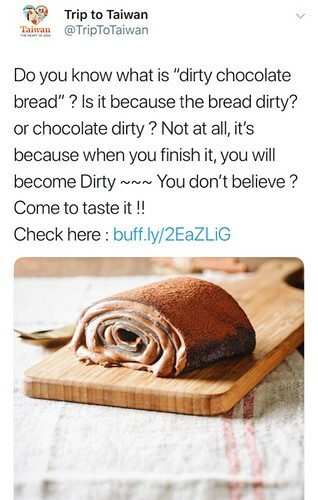 Well, I’m sure English teachers in Taiwan are feeling a little more secure in their jobs after reading this. Actually, the type of mistakes made pretty well represent the level, on average, of the English abilities in Taiwan. So, I find no problem with them…. I’m numb to it now. I completely agree with your article. I live in Taipei, am Taiwanese-Global Citizen, nutrition major and quite good at seeing things with an international lens. I am planning to do something about the embarrassment Taiwan Bureau is doing. If you have any ideas or want to join me in this project, please feel free to email (IngridLin1231@gmail.com) me. To further and to best promote Taiwan, I have made a six-minute unofficial video to attract more tourists to visit our beautiful island. The YouTube link is typed in the website section. I believe it is better than the ones made by the Taiwan Tourism Bureau because of its comprehensiveness and most up to date information. Most of all, the video is presented from a Pro-Taiwan perspective, a hundred percent. Instead of showing the National Palace Museum and CKS Memorial (shown in all official Taiwan promotional videos), mine’s showcases National Taiwan and Taipei Fine Arts Museums, the 24 Hour Eslite Bookstore in Taipei. Fort San Domingo in Danshui, the British Consulate in Kaohsiung, and Su-Ao Cold Springs. I have also highlighted aboriginal culture, the music & movie industry, and sports in my video to emphasize Taiwan’s diversity and uniqueness. Hope all viewers will find it informative! 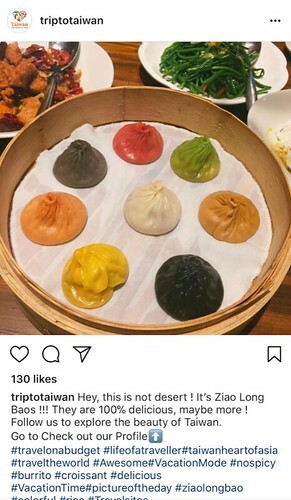 Why not use just one website visitTaiwan.com ? So, We Went to Kenting for 3 Days. Should You? Short answer: probably not. But read this anyway. 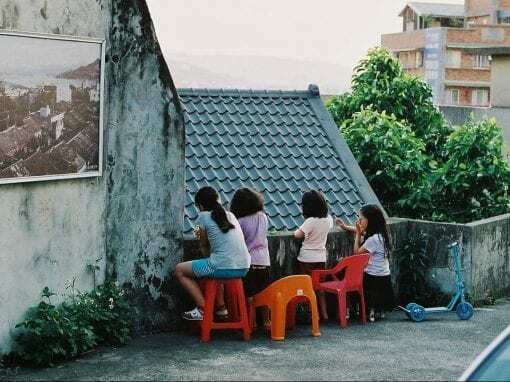 Why Aren’t People Having Kids in Taiwan?